An original letter of correspondence between brothers and business partners Joshua Coffin Chase and Sydney Octavius Chase. 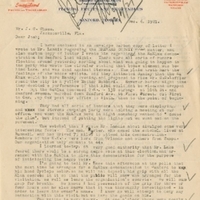 Topics discussed in the letter include a copy of a letter to Cary D. Landis in regards to the Brevard County Road, a copy of a letter to Landis regarding a Ku Klux Klan demonstration in Sanford on the eve of an election, a rumor that Forrest Lake arranged for the KKK to intimidate African-American voters, and movement of fruit at Isleworth Grove. Chase & Company was established by the brothers in 1884. The company sold insurance and later invested in storage facilities and fertilizer sales. Original letter from Sydney Octavius Chase to Joshua Coffin Chase, December 6, 1921: box 173, folder 2.36, Chase Collection (MS 14), Special and Area Studies Collections, George A. Smathers Libraries, University of Florida, Gainesville, Florida. Digital reproduction of original letter from Sydney Octavius Chase to Joshua Coffin Chase, December 6, 1921. Chase Collection (MS 14), box 173, folder 2.36, Special and Area Studies Collections, George A. Smathers Libraries, University of Florida, Gainesville, Florida. Chase, Sydney Octavius. “Letter from Sydney Octavius Chase to Joshua Coffin Chase (December 6, 1921).” RICHES of Central Florida accessed April 23, 2019, https://richesmi.cah.ucf.edu/omeka/items/show/2530.